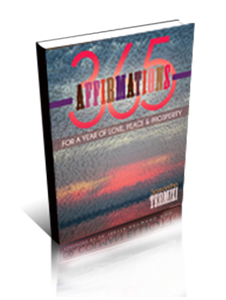 365 Affirmations For A Year of Love, Peace, & Prosperity is a self-help book for people who want to improve their lives by using daily affirmations. An affirmation is a statement that you repeat to yourself often or that you write down or look at frequently. Words have enormous power. If you would like to start improving your life you must first change your thoughts and to help you do this you use affirmations. Affirmations help to rewire connections in the brain. Neurons that fire together wire together and the ones that don’t, don’t. So lets help you to rewire your negative thought patterns because by changing the way you think you can change your life. Give it a try. Just for fun and see for yourself if it works. The way you have been thinking and acting has got you this far, to where you are now. And if there are some not so savory things in your life that you would like to change, let affirmations help you because I know they will. They helped me. In this book I list daily affirmations for you to use. My goal is to help you improve your life by changing the way you think. By changing your thought patterns you will also change the way you feel and therefore your life will start to unfold in more positive ways and with such ease, you will be astonished. I am so excited for you to get started and thank you for being the awesome person who wants to better themselves because as Rumi said “Yesterday I was cleaver, so I wanted to change the world. Today I am wise, so I am changing myself.” If we change ourselves, one person at a time, then the possibilities are endless for our world. I see a future where love, peace, and prosperity rules for all. You can literally be, do and have anything that you want. You are a worthy being. So go ahead and be the awesome person that I know you are! Follow your bliss and don’t let anyone else tell you other wise. Do what makes you happy and everything else will fall into place.